In many congregations in the United States, new faces in the pews have become rare. A new study from Exponential by LifeWay Research found 6 in 10 Protestant churches are plateaued or declining in attendance and more than half saw fewer than 10 people become new Christians in the past 12 months. The research gives a clear picture of the state of Protestant churches in America today. Most have fewer than 100 people attending services each Sunday (57 percent), including 21 percent who average fewer than 50. Around 1 in 10 churches (11 percent) average 250 or more for their worship services. 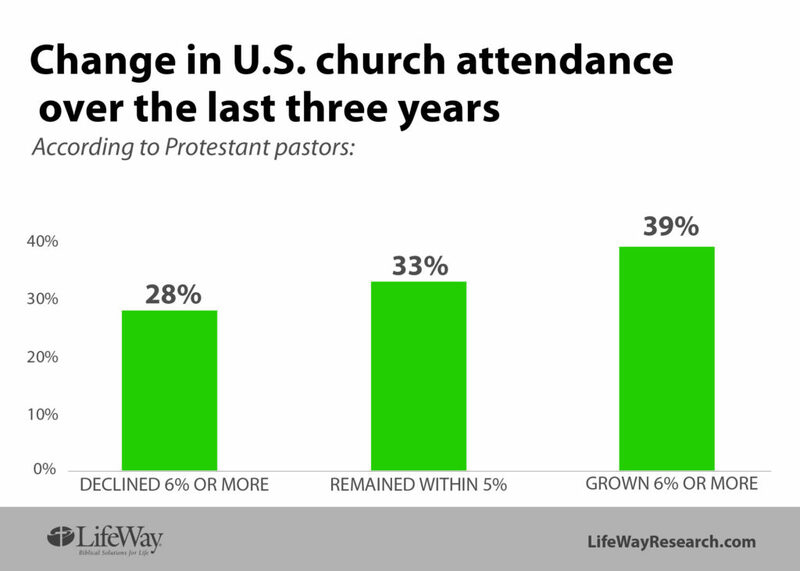 Three in 5 (61 percent) pastors say their churches faced a decline in worship attendance or growth of 5 percent or less in the last three years. Almost half (46 percent) say their giving decreased or stayed the same from 2017 to 2018. Twenty-eight percent of Protestant pastors say their church has seen worship service attendance shrink by 6 percent or more compared to three years ago. Another 33 percent say their church has remained within 5 percent, while 39 percent say their congregation has grown by at least 6 percent since the first quarter of 2016. More than half of 18- to 44-year old pastors (55 percent) say their church is growing, while 33 percent of pastors 45 and older say the same. Evangelical churches are more likely to be growing (42 percent) than their mainline counterparts (34 percent). Less than a quarter (23 percent) of churches with an average worship attendance of fewer than 50 say they are growing, while most churches with 250 or more in attendance (59 percent) are growing. Among denominations, Holiness (56 percent) and Baptist (45 percent) pastors are more likely to say their churches are growing than Methodists (33 percent) and Lutherans (25 percent). The lack of growth in worship attendance in most churches is matched by a lack of new commitments to Christ last year. Fifty-four percent of pastors say fewer than 10 people indicated a new commitment to Jesus Christ as Savior in 2018, including 8 percent who had none. In some ways, however, those numbers mask deeper evangelistic issues. When evaluating churches based on the number of conversions per 100 attendees, 67 percent had fewer than 10 per 100 people attending their church. Around a third (35 percent) had fewer than five new commitments for every 100 people attending their worship services. Forty-six percent of smaller churches (fewer than 50 in worship services) say they had 10 conversions or more for every 100 in attendance, while only 18 percent of churches 250 and above meet that benchmark. While there are no major differences between evangelical and mainline churches in terms of new converts, denominational differences do exist. A majority of Pentecostal pastors (57 percent) say they saw 10 or more new commitments to Christ in their church last year per 100 attendees. The next closest denominations are Lutherans (39 percent), Holiness (38 percent) and Baptists (35 percent). A quarter of Methodist (25 percent) and Presbyterian or Reformed pastors (23 percent) say they had 10 or more new commitments to Jesus in 2018 per 100 attendees. Half of Methodist pastors (50 percent) had fewer than five new commitments last year. Aaron Earls is a writer for LifeWay Christian Resources. For more information on the study, visit LifeWayResearch.com or view the complete report. Methodology: A phone survey of 1,000 Protestant pastors was conducted by LifeWay Research Jan. 14 – 30, 2019. The calling list used a random sample stratified by church size, drawn from a list of all Protestant churches. Quotas were used to maintain the correct proportion of each church size. Responses were weighted by region to more accurately reflect the population. Each interview was conducted with the senior pastor, minister or priest of the church called. The sample provides 95 percent confidence that the sampling error does not exceed plus or minus 3.2 percent. Margins of error are higher in sub-groups. Enter your email address to subscribe to the LifeWay News feed and receive of news via email.